LAHORE: As a second round of negotiations for the next National Finance Commission (NFC) award is scheduled here for next week, Balochistan has decided to push hard for significant changes in resource distribution arrangements between the Centre and the federating units as well as among the provinces in an attempt to secure a higher share from the federal divisible tax pool. More than two provincial government officials confirmed to Dawn on Saturday that Balochistan would fight for an increase in weight of some indicators in the formula for division of resources among the provinces. Besides, it would attempt to get another indicator — inverse cultivated land — added to the formula for horizontal resource distribution under the 9th NFC award. Quetta would also lobby to secure some increase in the provincial share of 57.5pc from the divisible pool of taxes as the Centre’s current share is 42.5pc. But conversations with officials from Sindh involved in deliberations over division of resources under the 9th NFC award clearly indicate that Quetta is highly unlikely to get much support for its demand to change the existing formula drastically for further reduction in the federal share from the divisible pool or division of funds among the federating units. 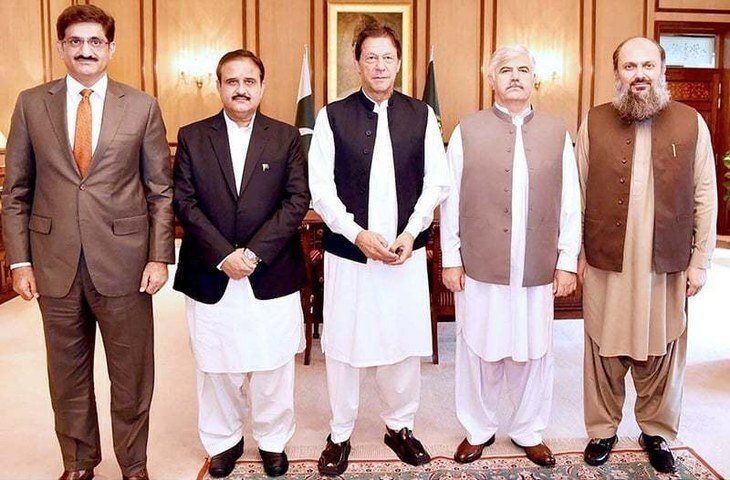 Balochistan officials directly involved in the negotiations for the new award told Dawn that in the second meeting of the reconstituted NFC scheduled later next week in Lahore, they would press for a substantial increase in resources for their province. The 7th NFC award, which was signed in 2009 and is still operative under a presidential order after expiry of its five-year tenure in 2015, had spiked Balochistan’s share in the provincial share from the previous 5.13pc to 9.09pc, acknowledging special development needs of the province facing religious terrorism and strife since the mid-2000s. Additionally, the award guaranteed that any shortfall in the province’s share (because of lower-than-targeted tax collection by the Federal Board of Revenue) would be made up by Islamabad from its pocket. The previous award also switched from population-based formula to a multi-indicator formula for division of tax revenue among the federating units. With poverty and backwardness given 10.3pc weight, revenue collection and generation 5pc and area or inverse population density 2.7pc, the multi-indicator formula helped increase Balochistan’s share in absolute terms. However, population still has 82pc weight in the existing formula. At the last month meeting of the NFC, Balochistan had proposed a drastic cut in population’s weight from 82pc to 57pc along with the increase in the weight of area/inverse population density from the current 2.7pc to 15pc in the formula for horizontal fund distribution. In addition, it also called for inclusion of inverse cultivated area as another indicator in the formula. “The Commission needs to at least revisit the formula for horizontal distribution of provincial share from the divisible tax pool among the provinces even if we don’t want the federation to part ways with a portion of its share because of the federal government’s financial problems,” said a senior provincial official while speaking to Dawn. Since the proposed changes will hit Punjab the most, the most populated province is likely to reject the demand outright if Quetta presses for them. As the Pakistan Tehreek-i-Insaf governs both Punjab and Khyber Pakhtunkhwa, the latter is also likely to reject Balochistan’s demand. Even Sindh, where opposition Pakistan Peoples Party rules, is reluctant to lend support to the demand at present. “…we want share of the provinces to go up, substantially, but we do not support such drastic changes that will hurt Punjab, which is facing severe financial squeeze, or other stakeholders. We want an increase in our share through greater tax revenue generation rather than through reduction in the funds for any stakeholder, be it a province or the federation,” a Sindh government official in direct knowledge of the provincial government’s stance on the issue said. Yet Sindh appears willing to consider a little increase in the weight of the indicator on poverty/backwardness to accommodate the largest province that covers almost 45pc of the country’s total area. “Balochistan is in a dire financial condition and cannot function with its present resources… our salary, and law and order expenditure has spiked manifold since the 7th award was finalised in 2009. We do not have adequate cash to fund our development. We want a bigger slice from the pie under the new award,” an official of the Balochistan finance department said. “The raise in our share under the last award has mostly been consumed by consistent increase in pay and pension of government employees during the past nine years, and the transfer of 3,000 federal jobs to the province after the devolution of a number of federal departments and functions under the 18th Amendment to the Constitution,” the official argued. He said the provincial expenditure on security had grown from Rs9 billion in 2009 to Rs38 billion this year, sparing little for development and public service delivery. The provincial budget for the present year shows that Balochistan is facing a big hole of Rs61.9 billion in its planned development investment of Rs88.2 billion as the pace of growth in its total income is projected to slow down to 4.9pc against 9.3pc estimated for the last financial year.